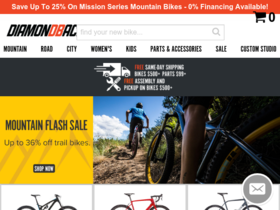 Diamondback, online at diamondback.com, is the destination for bikes and more. Shop sale at Diamondback for up to 60% off top products. Act now and enjoy up to 60% off plus free shipping on top products from Diamondback. Enjoy free same day shipping on select orders. See Diamondback.com for details. Check out Diamondback online for their latest special offers.